Introducing the Bioforce Certified Conditioning Coach Course, the first and most respected conditioning certification for serious fitness professionals who want to stay at the top of their field. Whether you call it conditioning, cardio, or energy systems, most fitness professionals struggle to put all the pieces together when it comes to conditioning. They feel confident in their strength and power programs—but when it comes to conditioning most of them struggle to consistently write effective programs. When it comes to “cardio” most trainers simply add high intensity intervals to the end of the workout and call it good. Or they neglect to put structured conditioning work into their programs at all! That’s a shame because conditioning is one of the most important—and most neglected—aspects of health and fitness. Here’s the truth: Conditioning is a secret weapon for athletes…and a proven lifesaver for general population clients. Let me tell you a quick story to show you what I mean. A few months ago I went on Facebook and asked my community WHY they read my blog and follow my work. I’m always trying to improve as a coach, and thought the feedback would be helpful. 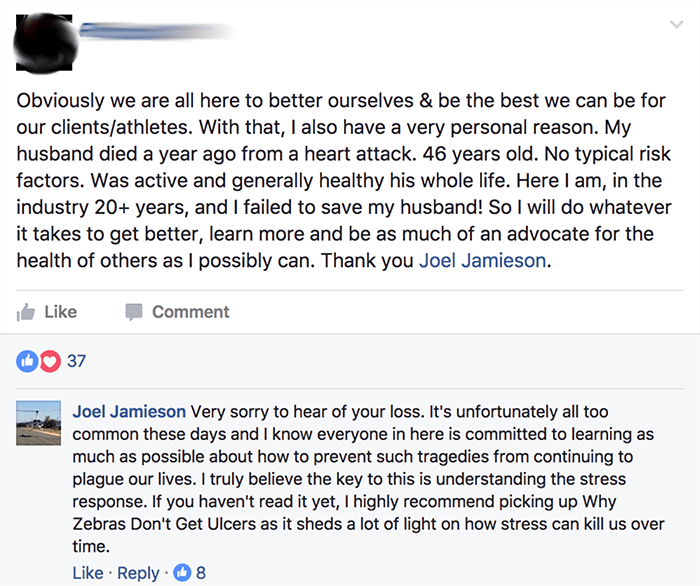 This woman’s brave comment left me thinking about my own family and friends and how important they are to me—and how I’d do anything it takes to help them get and stay healthy. It also left me thinking about how many coaches and trainers think that conditioning is only for high-level athletes. But it’s simply not the case. EVERYONE needs better conditioning. Unfortunately, there hasn’t been a lot of useful or practical information out there. Until now. Proven over 15 years. Trusted by top coaches and elite performers worldwide. Get better results. Grow your reputation. Stay at the top of your field. I created the BioForce Certified Conditioning Coach Course to make you 100% confident in your ability to write and coach effective conditioning programs, with any client who walks through your door. Get better results. Grow your reputation. Stay at the top of your field. I’ll walk you through everything you need to know—from the initial testing and assessment to exercise selection, periodization, training blocks, program management, monitoring, and more. Training methods don’t mean much if you don’t know how and when to use them. That’s why we’ll cover aerobic plyometrics, alactic intervals, cardiac power intervals, high-intensity continuous training, tempo intervals, the threshold method, recovery, regeneration, and more. So you always know the right tool for the job. We’ll dive deep into what conditioning actually is and how the body, brain, and environment all play very specific and important roles. We’ll cover motor control, stress reaction, motivation, movement, and more. This knowledge alone will put you in the top 1% of all coaches currently working in the industry. Feel confident that you can work with anyone—and watch your business and reputation grow. Once you understand the broad picture, it’s time to dive deep into specific groups to learn how to get the absolute best results. That’s why we’ll cover lessons and strategies for general population clients, tactical athletes, endurance competitors, team sports, and more. Get the 180+ page workbook mailed directly to your door, for free. workbook is your secret weapon. It includes breakdowns and cheat sheets of every single training method, along with full copies of every single slide from every single video, so you can take notes and refer back as often as you need. After you complete a simple 50-question quiz and score a 80% or higher, we’ll mail you your certificate to prove that you’ve gone through the entire BioForce Certified Conditioning Coach Course. Join the free Insider’s List—and save $200. The next certification opens again in 2019. To make sure that every coach gets the help they need, I only open the certification twice per year. Also, to reward those who are serious about continuing their education, I offer a $200 discount to any coach who joins my Insider’s List. Everyone else pays full price. Is the BioForce Certified Conditioning Certification right for you? 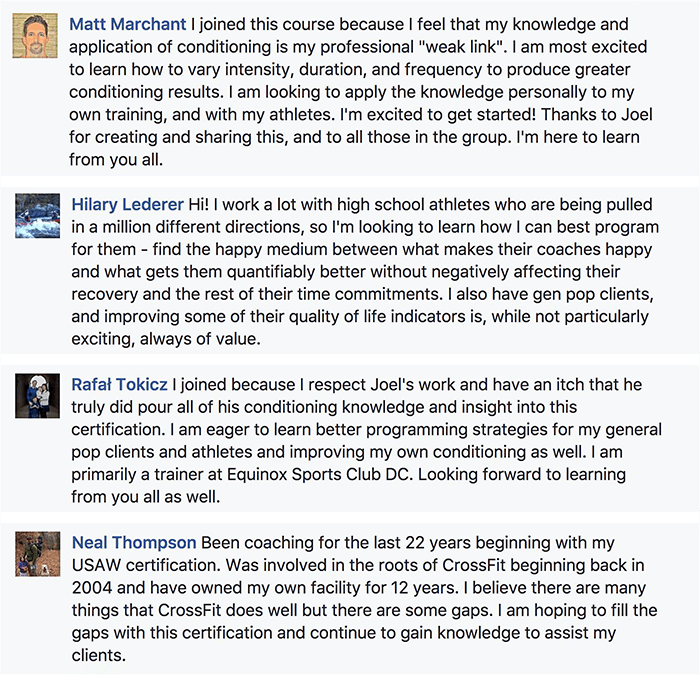 I want to be clear: the Bioforce Certified Conditioning Coach course isn’t like other certifications out there. We’re not gonna waste our time on outdated science or getting lost in the muck of theory. That said, the BioForce Certified Conditioning Coach Course isn’t for everybody. You don't have any clients or work with any athletes. Look, I think investing in your education is a smart move, no matter where you're at in your career. However, if you're just starting out, I'd encourage you to work with a few clients first. Get your very basic certification if you haven't yet. Figure out if you even enjoy being in this field. Education comes from learning through certification courses like this and from the real-world experience of training people. I suggest you start there first, and see if you're ready to make this a career. I'll be here to help you when you're ready for the next step. Certifications are valuable because they show that you’ve put in the work. Your certificate communicates to your colleagues, your clients, and to yourself that you took the necessary steps to further your education. That’s important. However, a piece of paper is meaningless on its own. Nothing in the BioForce Certified Conditioning Coach Course is going to work for you if you don't put it into practice. So please don't invest in this if you're just gonna add a new certification to your wall and not use the material you learn. You're simply looking for new exercises, templates, and techniques. I’ll give you dozens of techniques and strategies in the BioForce Certified Conditioning Coach Course. But this isn't merely a collection of templates or something to just grab and go without thinking critically or testing the strategies. Put simply: What you'll learn here will challenge you and push you to become a better coach. Be prepared. You're a coach who's committed to being at the top of your field. If you're someone who takes pride in your work and is always striving to become a better coach, the BioForce Certified Conditioning Coach Course was made for you. I believe we all have something to teach each other — which is why I'm always learning and connecting with coaches and experts I respect. It's also why hundreds of coaches have come to me in order to learn how I approach conditioning. I want to teach you what I’ve been fortunate enough to teach them. You want practical conditioning strategies you can use with your athletes and clients, starting immediately. Sure, we'll go through theory, too. We'll dive deep into the science behind energy systems development, the relationship between the body, brain, environment and more. But the true focus of this course is practical application. That means giving you the tools you need in order to feel 100% confident in your ability to write and coach successful conditioning programs. You want a self-paced system to work through on your own time. If you want to sit down and binge-watch a dozen videos at a time, that's fine. If you want to watch one video a day, that's fine too. If you go on vacation or just get busy and don't watch anything for a couple of weeks, no problem. The material will be there for you whenever you're ready for it. To maintain a high-quality experience and ensure all my students get the attention they deserve, I only open doors to the BioForce Certified Conditioning Coach Course twice per year.  The general price is $797 paid-in-full, or $97 per month for 10 months. But to reward the people who are serious about continuing their education, I offer a $200 discount to any coach who joins my free Insider’s List. General price: $797 paid-in-full, or $97 per month for 10 months. Insider’s List price: $597 paid-in-full, or $79 per month for 10 months. Work with athletes? They’ll begin performing at their highest level, able to go longer and harder than ever before—and hardly able to believe it. Work with general population clients? They’ll actually look forward to their cardio sessions and start being more consistent with their training, in and out of the gym. Plus, they’ll be better protected from cardiovascular disease and live a better life because of it. 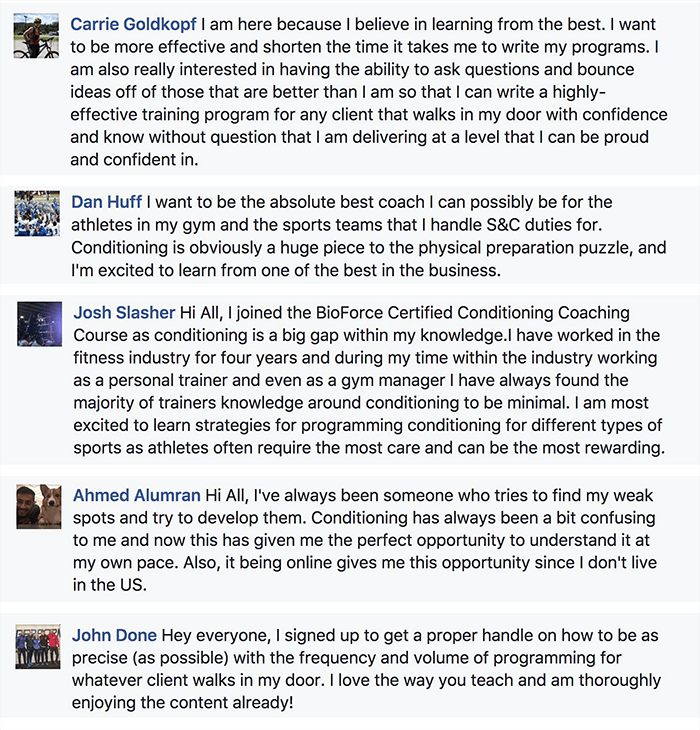 The BioForce Certified Conditioning Coach Course is only open to new students twice per year. Join the free Insider’s List below to save $200 on the certification when it opens again in 2019. Join the free Insider's List to get more information about the Conditioning Certification—and save $200 when it opens again in September, 2018.